WHEN WE WILL REVEAL THE TREASURES WE HAVE FOUND DURING OUR SUMMER OF SEARCHING. 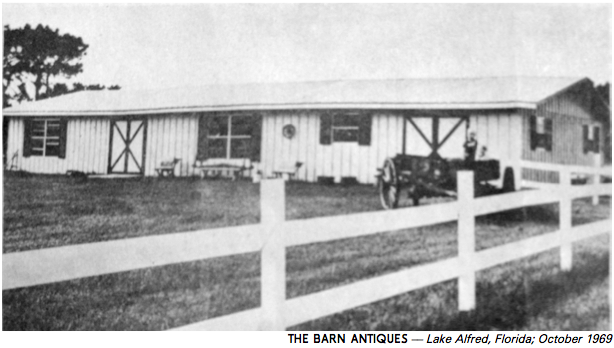 The Barn Antiques, established 1969, is a large, family-run antique shop in rural Central Florida. We sell a wide range of furniture and small items, most of them dating to the early 1800s through the 1940s. Our antiques' story starts in England. We hand-pick the best furniture and small pieces from across the English countryside. We fill and ship new containers from England nearly every month. That's how we always keep a fresh selection of the highest quality, most affordable antiques – big and small – to be found. We lovingly clean, polish, and restore each piece to the sturdy quality of its original condition. Our craftsmen preserve each piece's character and history, preparing it for its next century of use in your home. Once each piece is up to our exacting standards, we move it to our bright, spacious showrooms. Our four showrooms are over 7500 square feet, so you have plenty of room to appreciate each piece in all its beauty. We send email no more than once a month, and we never share your address.